Have you tried using the PEER strategy when reading with your children? I discovered it when looking through resources on the IRRC website. It was a quick and easy way for me to discuss books with my children. I am always looking for ways to help my children grow as readers and thinkers. Though we read together daily, I am not always confident I am doing all I can when I read aloud, so I keep my eyes peeled for new strategies. I was excited to find the white paper "The Power of Interactive Read Alouds" by Gwen Marra, Ed.D., on the IRRC website. This article shares strategies for using discussion (or interaction) during read alouds to help children build vocabulary and make connections. Dr. Marra describes the importance of children building “word knowledge” and “world knowledge.” She explains that the “use of discussions during read alouds promotes the meaningful use of new vocabulary by the children, and it leads them to make connections between new information and previous knowledge.” I know having discussion with my children is important, so I welcome any tips for how to incorporate it into our reading. Dr. Marra suggests two methods for making read alouds with children more interactive. This week I chose to focus on the Prompt, Evaluate, Expand, and Repeat (or PEER) strategy, which has an accompanying template to help plan for discussion. “The Power of Interactive Read Alouds” is written with educators in mind, but PEER certainly can be applied at home. Below you will find steps for how I easily used PEER to help create discussion with my children during reading. Dr. Marra suggests that using a balance of fiction and non-fiction texts, or books, is important. I chose one of each. How many stages are there in a chicken’s life cycle? What are the stages of a chicken’s life cycle? Why does a chick need an egg tooth? Tell me the difference between a rooster and a hen. The first “E” of PEER is about deciding if your child’s response is correct or not. When I asked about the number of stages of a life cycle a chicken has, they correctly answered “three,” so I said, “That’s right. A chicken has three stages in it’s life cycle.” Dr. Marra suggests using the target vocabulary as often as possible. By restating my children’s answer with the target vocabulary included, I also was completing Step 6 of PEER (described below). 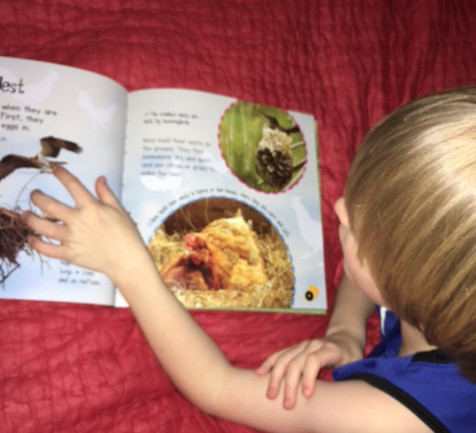 When I asked my children about the purpose of an egg tooth, Ryan first said, “To pick up bugs to eat.” I directed her to the diagram on the page we were reading and asked her what was happening to the chick. As we looked at the pictures of a chick hatching, I asked her how she thought an egg tooth might help the chick get out. By then, she was able to connect that the egg tooth is a sharp point on a chick’s beak to help it hatch out of the egg. We also talked about how they saw a duckling hatch at a museum a couple years ago, so my children were able to connect that to what we had read. The second “E” of PEER means to build upon your child’s answer, while correctly using the vocabulary words. So, when I asked my children about the difference between a rooster and a hen, Griffin responded, “A rooster is a boy and a hen is a girl.” I said, “Yes, a rooster is a male chicken that is larger and has longer tail feathers. A hen is a female and lays eggs.” My expanded response provides another way to repeat what my children are saying. That is the last step in PEER. This method was a great way for my children to learn new vocabulary words, practice using them, and build knowledge. What I liked best about using PEER was that it encouraged me to notice key words and helped me emphasize them. If you want to learn more about the research behind interactive read alouds or PEER, read "The Power of Interactive Read Alouds." Also on the IRRC website is a printable PEER bookmark that families can use to help remember the PEER strategy while reading with children.